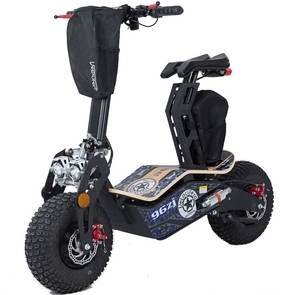 The Citi Comp II 1600 watt electric scooter PowerBoard offers you an enhanced ride with a full suspension and a super strong 1600W electric motor that achieves speeds of about 30 MPH. Plenty of power and torque to climb hills or tackling any terrain you may found. Works in the rain too! The high-tensile steel frame features a highly durable deck with 4 12 volt batteries (48 volts of power)! It's also set-up with 11-inch tires and Smart Power control. Great for getting around quickly. Comes with seat, battery pack, and battery charger! Yes, the scooter folds down for transport. Want more? Buy right now and we will include dual front led lights and a scooter carrying bag! Front "Cam-Link" Suspension - Unlike the competition, this is a true suspension system that offers a smooth ride, while offering excellent resistance over bumps. Twin Tube Frame - Superior design, quality welding and quality steel. Warranty: 60 Days, Parts Replacement. We carry all spare parts just in case, but this is a high quality scooter with great feedback from our customers.